Update: I stopped writing this post, it got too long, and I got bored. 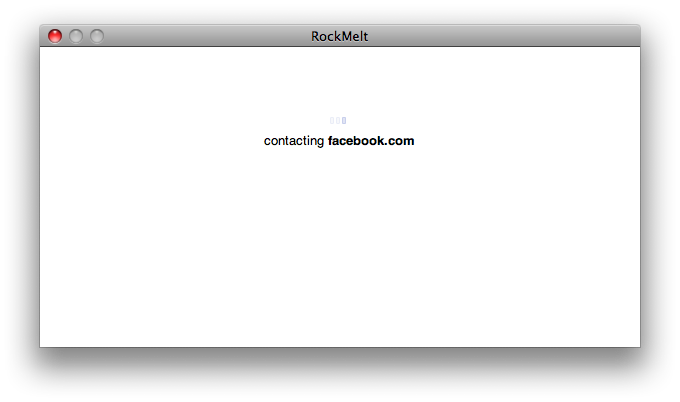 Also, it looks like Meebo might have just pwned RockMelt anyway, with their MiniBar. This is an ever-changing space, and will require a followup post! It’s too early to form a proper opinion on this one, but here’s some initial thoughts. 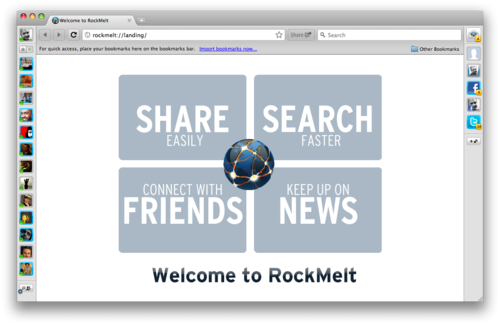 Rockmelt is a social web browser built off of Chromium and boasts deep integration with both Facebook and Twitter with it’s “Edges” which are filled with friends that are online and feeds that you follow complete with update badges. Completely achievable with a browser plugin? I think so. It also sports what some believe to be the next big search revolution. 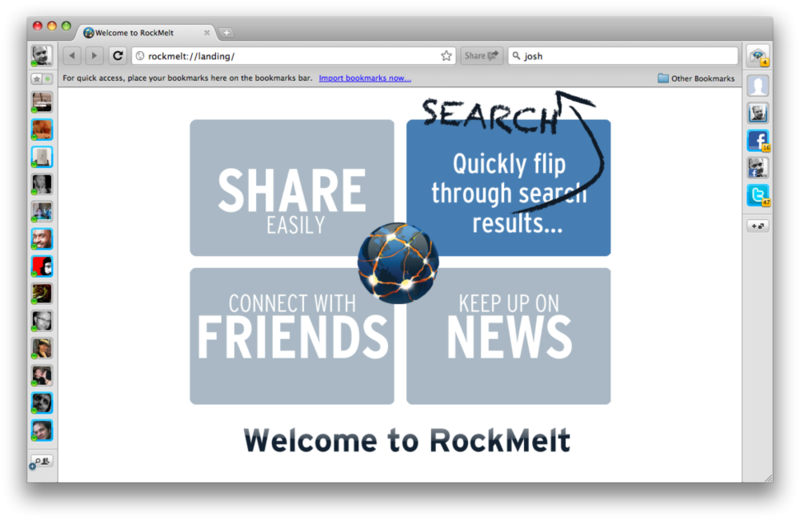 Unlike Google’s universal navigation field, RockMelt has a dedicated search field that shows complete search results as a drop down overtop web pages. This is helpful when switching between different search results from one single query. So the search is displayed over the page you’re on. Again, this is just a plugin, right? I don’t know of any plugin that got almost $10m investment. But a browser, ooh, now that’s compelling. I wonder which one have the widest adoption, the easiest path to become a user, the smallest change in behaviour required. The answer these days, is a webapp, Not an installable piece of software. (A discussion for another time maybe) But for the sake of this argument, I would bet that plugins have lower barrier to entry, technically, but emotionally, people are more likely to be compelled to try out a new browser. So it’s a browser with FaceBook, Twitter, and some kind of clever search thing going on, right? Well yeah, basically. UX and bugs aside (those are solved with time, iterate and deploy, small and often), there are a bunch of interesting things to note. I’m not even going to touch on the so-called social features. What I’m going to talk about are the decisions they’ve made so far, and where I think that means they’re heading. The integration with FaceBook goes too far in my opinion. The first time you open the app, you’re asked to connect it to FaceBook. Every time you open it it connects to FaceBook. Not only does this slow you down, (not to mention being offline? ), but let me put this simply, to use your browser, to access the web, you have to first login to FaceBook. As some have mentioned, this may just be how things work now, we give up some data for a perceivably more valuable return, we think we’re the ones winning. when #facebookdown, taking Facebook Connect & fb social plugins with it, how do you log in to all those other websites then? now do you see? This potential single point of failure is just unacceptable. Anyone building a browser in 2010 should know better. No doubt this will change. This probably won’t matter to most ‘normal’ users until it’s a problem. When you’re at a gig, you only notice the sound engineer when he fucks up. 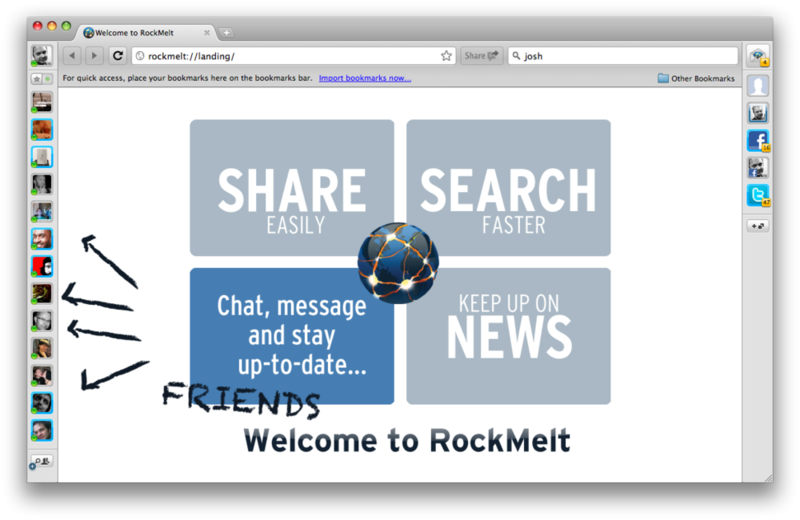 But will a ‘normal’ person ever use RockMelt? No. Unless FaceBook buy them. Which may well be the plan here. Well some is in the browser: browsing history, bookmarks. Is it being passed to FaceBook? I doubt it. Why would they? Access to the data is a reason to acquire (and a reason FaceBook would build a browser, like Google with Chrome, extra reach). Some of your data is still in FaceBook, or Twitter. Which is fine I guess. As fine as it would be anyway, at least. 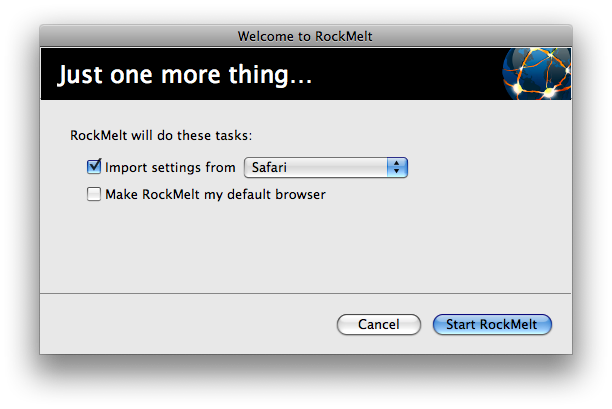 Is RockMelt going to do anything clever with these two sources.. now that’s a question. With the permission models that we all accept now, apps are able to do things that would have been considered evil if it was based on cookies. We ticked the terms box, right? Yes, there are technical, and legal, things to consider here, but essentially there is an opportunity to do something cool, and now your users are ok (technically) with you doing it. So you want to connect to the places you hang out most (for some reason). And you want to let something watch you the whole time while you’re online, for some sort of benefit (that might not be clear yet). And you probably spend 99% of your time in only a few places. I guess it makes sense to use a browser that allows you to do those things. But this comes with baggage. Firstly, you have to install it. Who does that anymore? Installed apps have to be updated. Your users may be on several different versions of your stuff. Rolling out fixes takes quick action on your user’s part. And bandwidth to deploy. And then there’s the various OSs that it might be used on. Aren’t we favouring webapps to solve these problems? How about a compromise, a browser plugin. Sure, you could do all the same stuff, while not having all the same issues. But plugins? Until they’re called apps, people won’t care. There’s a thought..
Meebo have just done this, with the Meebo MiniBar. What took so long! 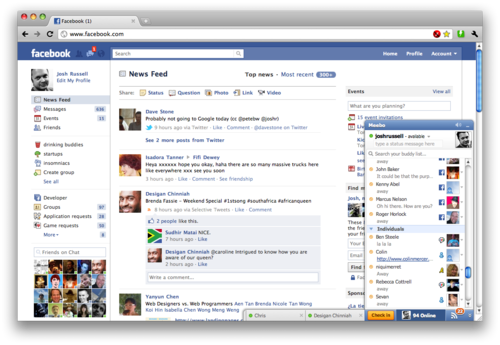 Notice the Meebo bar ON FACEBOOK OMG! Surely I’ll be able to drag, drop, share, blah.. pretty soon. If people do that anyway? 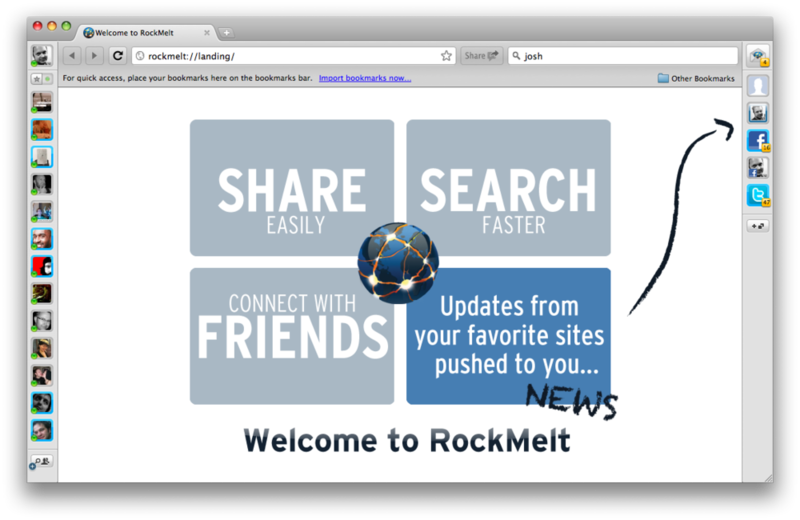 RockMelt could simply be a webapp. We have a few things already that do most of what it does.. Cliqset, Brizzly, to name a couple. What does it take to do basic browsing inside it? Or for a plugin (app) to work closely with it’s web-based parts to bridge this gap. The reason I would make it a new browser is easy. You’re always using it, without even thinking about it. Assuming you’ve installed it, set it as your default, and stop clicking that Firefox icon in your dock. When you occasionally need the thing this new browser does, the button is there. But most of what it does can be done on the FaceBook or Twitter sites themselves, so as long as you don’t forget that they exist, what do you need a special browser for? We should be abstracting the browser layer away entirely in my opinion. As we’ve basically done with the OS. 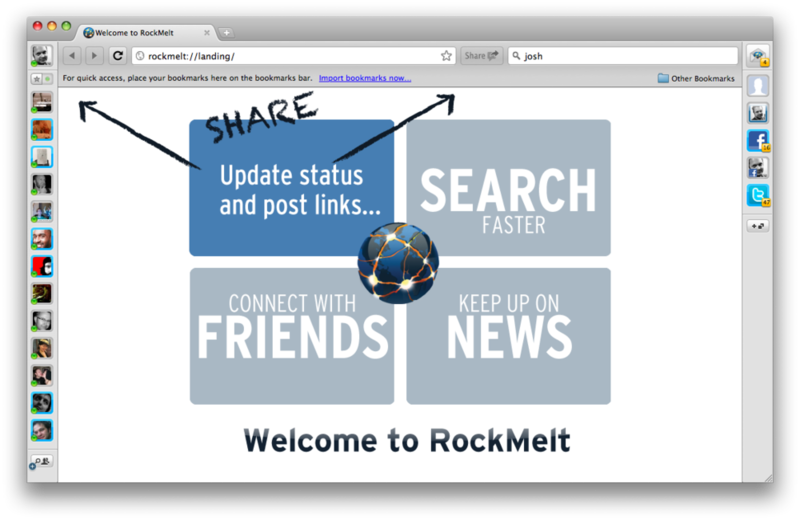 RockMelt is highlighting that most of what we do is on the web itself.